We've created and handy guide to get you up to speed with all the latest trends in the wedding photography world. Traditional Wedding Photography: This style of wedding photography usually involves a very formal approach. A traditional wedding photographer will shoot a set list of photographs and work to ensure that these are of the highest quality. The term doesn’t really refer just to lots of group shots but also to all the key moments, signing of the register, cutting the cake etc. The photographer will endeavour to get all these key images in a posed style and will have lots of experience in arranging group shots and posing you for portraits. A traditional wedding photographer will likely have had some formal training or have worked as an assistant to an established wedding photographer. The advantages of this style are that you can be pretty sure of what you will get and that the photographer will be very efficient and professional. It does, however, involve a great deal of control being given over on the day and the photographer will need to order guests around to get the photographs shot. 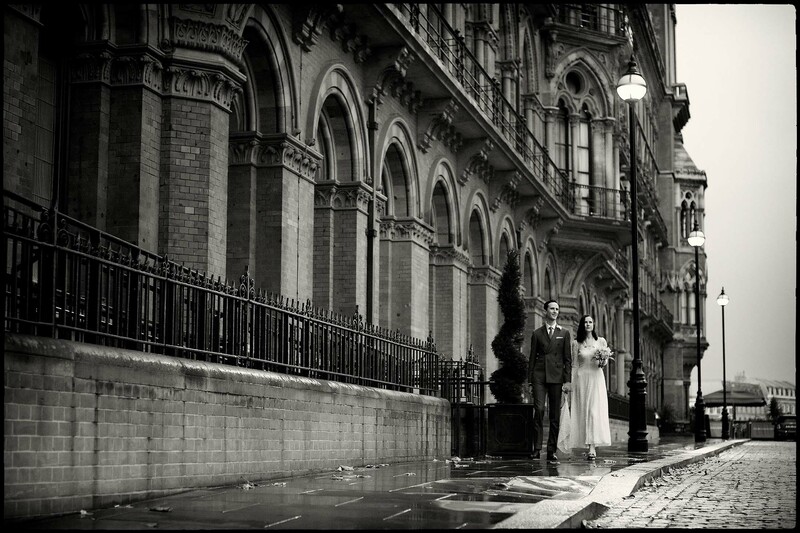 Contemporary Wedding Photography: The contemporary style of wedding photography is a more artistic/ fashion approach. This style involves a less rigid, formal technique and focuses on beauty, fashion and posed images that are inspired by editorial fashion photography. The photographer is more likely to plan his shoot in advance and may visit the venue to choose locations for the pictures. The emphasis is placed more on interesting and artistic poses, clever use of light and locations and the images may well be re-touched and effects applied in post-production. Of course, by its very nature, contemporary wedding photography is constantly evolving and the increasing competition between photographers to come up with new and exciting images ensures a wide variety of approaches. From your point of view you only really need to decide if you like the style of the photographer's works but you must be comfortable with posing as the photographer will most likely expect to direct you to get the shots required. Reportage Wedding Photography: The photojournalistic approach to wedding photography has become increasingly popular in recent years. The emphasis is on more candid and unposed photographs that appear more natural and focus on telling the story of your wedding day. A reportage wedding photographer will try to capture the day as it unfolds without interfering or ordering you around. This approach has emerged in the digital era as the photographer will probably shoot hundreds of images and edit the photographs afterwards. Many of the photographers who shoot in this style will have previous magazine or newspaper backgrounds and be used to shooting large events and dealing with fast-moving situations. The main thing to decide is the style of photography you like and how long you’d like to spend posing for photographs on the day. Many photographers will combine a mixture of styles to ensure the best coverage. For example, most reportage wedding photographers will also shoot a small number of formal group shots, and a contemporary wedding photographer will also shoot some candid photographs throughout the day. There are a wide variety of wedding photographers listed on Find a Wedding Photographer's main directory pages but the site also features specialist reportage wedding photography, contemporary wedding photography and traditional wedding photography sections. What kind of wedding video service would you recommend? I want it to be very romantic, My husband loves such things.